The cover of Alliance of the Golden Witch, the first complete release of an Umineko game, which consists of the four games of When They Cry 3. Umineko no Naku Koro ni (うみねこのなく頃に, Umineko no Naku Koro ni?, lit. When the Seagulls Cry) is a Japanese murder mystery dōjin soft visual novel series written by Ryukishi07 and produced by 07th Expansion. The story focuses on a group of eighteen people who are on a secluded island for a period of two days and the mysterious murders that befall them. The goal of the game is to discern not only the identity of the murderer, but whether the culprit is even human at all. Square Enix, Ichijinsha, Kadokawa Shoten, and ASCII Media Works all published various manga adaptations of the series, all written by Ryukishi07. Kodansha Box published a series of light novels written by Ryukishi07. The series was also made into a 26-episode anime by Studio Deen, which aired in Japan between July and December 2009. The game was re-released by Alchemist under the name Umineko no Naku Koro ni ~Majo to Suiri no Rondo~ (うみねこのなく頃に ～魔女と推理の輪舞曲～, Umineko no Naku Koro ni ~Rondo of the Witch and Reasoning~?) with updated graphics on December 16th, 2010. A fighting game based on the franchise was released by 07th Expansion on December 31, 2010. The word umineko is the name of a type of seagull known as the black-tailed gull. Naku means to make sound (鳴く), specifically referring to the sounds made by non-human organisms. According to the original creator, Ryukishi07, the red character Na (な) in the logo is an official part of the title. 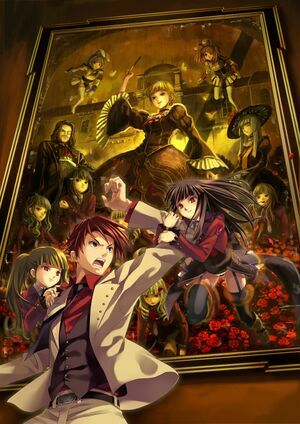 Umineko no Naku Koro ni is a murder mystery game described as a "sound novel" by 07th Expansion. A sound novel is similar to a visual novel, though the gameplay requires no player interaction as the game is composed entirely of text dialogues. While a visual novel's basis would be the visual aspect, as the name suggests, a sound novel's basis takes more care in producing an atmosphere via the music, sound effects, and the story itself. As such, the original Umineko games have a simple-looking art style, which stays consistent over the course of the series' releases. The original releases contain no voice acting for the characters. While during gameplay, the TIPS Mode can be viewed via the game's internal menu, which also includes save and load functions. These tips allow the player to read various supplementary information on the characters and story that may or may not be useful in solving the mystery. These are updated according to the progression of the story, so it is recommended to view the tips every once in a while. The ultimate goals of the gameplay involve reaching the truth behind the multi-cased mystery, determining where the gold is hidden, figuring out a solution in which ultimately everyone survives, and to solve the whole case by determining who the true murderer is in each chapter and whether it is due to supernatural events or human actions. An in-game feature from Turn of the Golden Witch onward known as "red truth" states something to be true in red text, offering clues to the reader to both create theories as well as to break them. In contrast is "blue truth" from Alliance of the Golden Witch onward, which is used to bring up theories on what is truly going on while abiding by the red truth, and has the possibility to become true if not countered by red truth. There is also "golden truth" introduced in End of the Golden Witch which can only be used by the Game Master and, depending on how it used, can be either inferior or superior to the red truth. Finally there is the "purple declaration" introduced in Twilight of the Golden Witch, which is used by the suspects of the mystery scenario and is equal in value to the red truth, except that only the culprit may use it to lie. When an episode is completed for the first time, an additional short epilogue called "Tea Party" becomes available to play, offering crucial plot points that advance the overall progression of the story. When that scenario is completed, a second epilogue called "????" also becomes available to advance the story. After all the scenarios in a given game copy have been completed, a Music Box section becomes available on the title menu, enabling the player to listen to any of the music used throughout the game. Umineko no Naku Koro ni takes place primarily in the year 1986, during the time frame of October 4 and October 5 on a small, secluded island named Rokkenjima (六軒島?) 10 km around owned and lived on by Kinzo, the head of the wealthy Ushiromiya family. Kinzo is near death, and eight of his family members arrive on the island for the annual family conference, where the adults plan to discuss how Kinzo's assets will be divided once he is dead. Also on the island are three family members who live there, five of Kinzo's servants, and his personal physician. After the eight family members arrive, a typhoon traps them on the island, and shortly after, strange things start to happen and people start dying. The main character of the story is Battler Ushiromiya, son of Kinzo's second son Rudolf. Battler has not been to the annual Ushiromiya conference in six years due to living with his maternal grandparents ever since his mother Asumu died, and even took his mother's maiden name instead of Ushiromiya. When his grandparents died, he went back to living with his father, his second wife Kyrie, and their daughter Ange, his half-sister. Once on the island, Battler once again becomes acquainted with the legend of the golden witch Beatrice who supposedly lives in the naturally dense forest on Rokkenjima. A portrait of her lies in the entrance hall of the Ushiromiya family mansion, and a puzzling epitaph is written below the portrait. Rumor has it on the island that Beatrice gave ten tons of gold to Kinzo in the past to restart the Ushiromiya family after being crippled in the 1923 Great Kantō earthquake. It is said that whoever solves the riddle of the witch's epitaph will receive the gold and be the next successor to the Ushiromiya family. Once the typhoon hits, a ghastly game begins, starting with the murder of six people on the island. If the witch's epitaph cannot be solved, people will continue to die in mysterious deaths, following the outline given by the epitaph itself, until the witch Beatrice ultimately revives. From this point on, Battler and Beatrice are locked in a game of twisted logic where Battler must attempt to explain all of the mysterious events on Rokkenjima from the standpoint that they are caused by a human, and Beatrice attempts to explain everything with witches and magic. If Beatrice can get Battler to ultimately surrender and accept witches and magic, Beatrice wins. Umineko no Naku Koro ni is sometimes referred to as "Seacats", a result of the fact that the Japanese words "umi" and "neko" separately mean "sea" and "cat". This page was last edited on 17 April 2019, at 19:13.